piranha's first point about lighting matches in an environment with a volatile fuel and enriched oxygen concentration is a good one. This can indeed be a very bad idea, for what I hope are obvious reasons. You need to carefully plan any experiment involving dangerous propositions like this. I was reasonably safe here for two reasons. 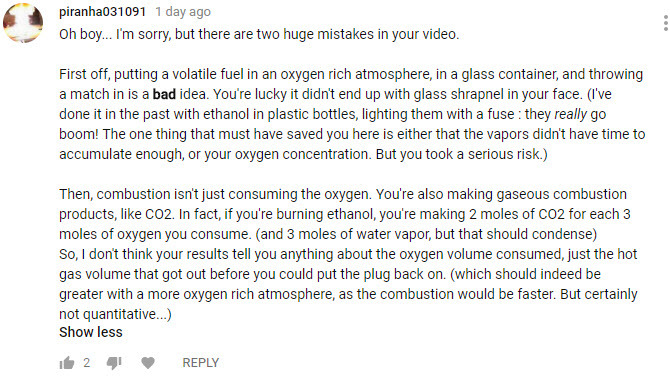 First, the fuel (ethanol) was not vaporized. My method was to soak a cotton ball (half a ball, actually) with ethanol (70% EtOH), place that in the container, and light this on fire to consume the oxygen in the contained volume. This meant that the ethanol was almost entirely liquid absorbed in the cotton, and very little had vaporized. 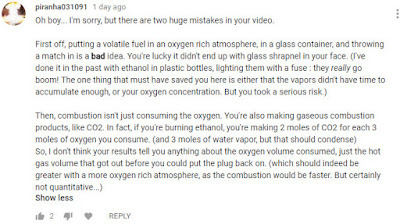 Truly dangerous situations develop when the fuel is fully vaporized, which I believe is what piranha was referring to. Second, I was well below the explosive limit of ethanol. Mixtures of combustible materials and fuels will only react within a well-defined concentration window. The lower end of this is the Lower Explosive Limit (LEL), which for ethanol and air is 3.3% (source). This means that below an ethanol vapor concentration of 3.3%, there is simply not enough fuel for an explosive situation to develop. In my experiments, I used roughly 2mL of 70% ethanol to saturate the cotton balls. The volume of the container was 630mL, so taking 3.3% of that means we need 20.8mL of pure ethanol vapor in order to be explosive. Since my fuel was a tenth of that volume, was only 70% concentration, and was not fully vaporized, I was well below the danger line here. The situation with the enriched oxygen from the permeate stream, however, is potentially different. I could not find any data on LELs for ethanol in enriched oxygen environments. If we take Generon's expected output concentration of 40% oxygen and assume a linear relationship (which admittedly could be a very wrong assumption), that's still 1.7% or 10.7mL, far above what I used. Side note: One other danger that he didn't mention but that I was very aware of is the container itself. Separatory funnels are not designed to withstand pressure - the wall thickness and shape are bad for pressure differences. Round bottom flasks, by contrast, are designed for pressure. They have thickened walls and the spherical shape distributes pressure evenly. The weird shape of a sep funnel could lead to stresses that could shatter the glass at high vacuum. When I was doing this experiment with the enriched oxygen from the permeate stream, I had on a face shield, heavy gloves, and a leather welding jacket (except, of course, for the one I recorded for the video. Whoops!). I believe I was reasonably safe, however, because I was only creating at most a half-atmosphere vacuum. I still wouldn't want to do this very often though, and risk repeated stresses building up to failure. Since 5 mmol is soluble in that amount of water, and we only produced 3.3 mmol, all of this gas is capable of dissolving. Thus, it should not contribute to the overall volume measurement in the end*. Next let's consider the other end of the spectrum, the highest concentration I measured from the permeate stream. If we again assume Generon's expected 40% oxygen value, we expect there to be 252 mL in the 630 mL sep funnel volume. Following the same math as above, 2/3 of that is 168 mL which equates to 0.007 mol CO2. Using the highest water volume I measured, 296 mL, we find that 0.01 mol CO2 is soluble. Thus 10 mmol is soluble and only 7 mmol was produced, so again this should all dissolve and not affect our volume measurements. From all this we see that while a lot of carbon dioxide is produced when burning up the oxygen, it is all capable of dissolving in the amounts of water used in the experiment. There is also a lot of water produced during combustion, but that too will not contribute after it condenses (which piranha pointed out, and you can see in the video as fog on the inside of the glass). Thanks very much to piranha031091 for taking the time to leave a detailed comment; this was a fun exercise to figure out, and I believe it helps to back up my results. Thanks to everyone else that comments as well. Your support really keeps me motivated to continue posting content! *Practically speaking it may have had some effect, since it does take time for dissolution to occur. For best results, I should have waited a longer time and/or closed and shaken the sep funnel to encourage full dissolution. This also doesn't consider any CO2 that may have already been dissolved, but I imagine this would be pretty minimal since it makes up only a tiny fraction of air.